Mobile Phoning it in for over 8 years. Mobiles Phones have been around for a while but this here is my personal history. I’ve never been a heavy user of mobile phones over the years I’ve owned quite a few and for various reasons moved on, so here I have detailed my experiences with them starting from the start. Released in around 1999 and owned around 2000. Technically this was the family mobile phone but being a big fan of gadgets I claimed it as my own and would ask to borrow it any chance I could get. Even then the idea of a portable telephone was amazing we didn’t have cordless phones in the house so this was even more fascinating, the only thing that caught my attention like this before would have been my dad’s work pager but that didn’t last for long as it didn’t really do much unless he got called into work. I don’t remember the deal specifically but we saved up coupons from Coca-Cola and sent away presumably with a cheque to receive our Coca-Cola branded mobile phone on the T-Mobile network pay as you go. 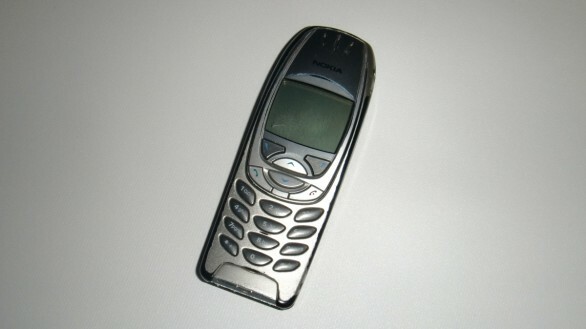 Memorable for having a ring tone editor this phone later died for unknown reasons and was never repaired. At this time children my age (15 in the year 2000) probably would not have owned a mobile phone, but my most memorable usage would be a school trip to France were I used it whenever I could except for actually making calls because that would cost money it didn’t have any games so time was spent trying to make cool sounding ring tones which never sounded anything other than a lot of noise. This caused a slight problem when on the bus ride home from the London leg of the journey the battery was dead and so I improvised with a 6 Volt Road Lamp Battery the big battery used in some torches, surprisingly this did actually work although this could be the reason the phone died later on. Released in around 1999 and owned around 2001. This truly was my phone, this must have been quite the bargain at the time as everyone in my family except for my youngest sister was given one of these phones, they were on the one2one Network pay as you go. 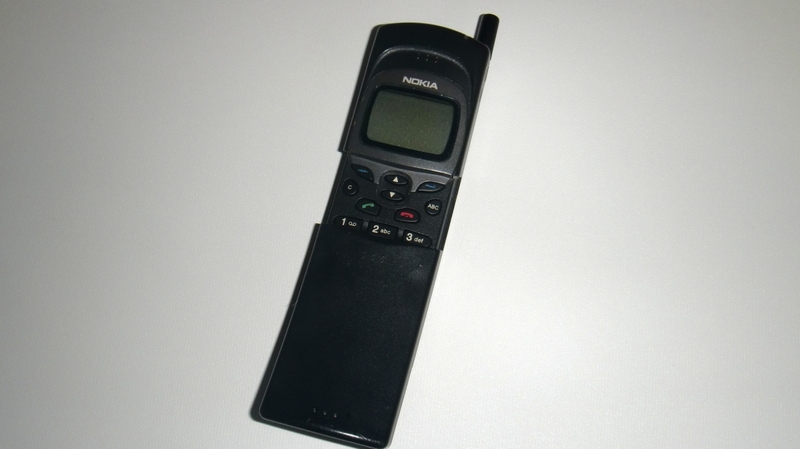 As a note on the side history my dad’s work pager had now been replaced with a Nokia 5110 which was much more exciting with the game Snake on it and I had the high score on it. 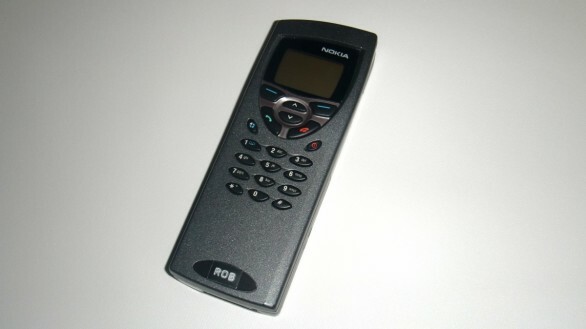 Although Mobile Phones were not explicitly banned at school I still wasn’t allowed to take mine, but that was fine as text messaging your friends outside of school was it’s purpose, then when we did go out we would test this phone to destruction, it seemed to be almost indestructible as we smashed it on things and flung it through the air the aerial broke off a bit but apart from that the phone still functioned for quite some time until it was replaced. Released in around 2000 and owned around 2002. A very iconic mobile phone along with the earlier model the Nokia 3210, this was still an entry level mobile phone and as my friend at college was upgrading his mobile he sold me his SIM card and all which proved interesting when I would receive calls from people trying to get a hold of him, this time I was on Orange pay as you go. Memorable for being a phone you can customise initially having a ring tone editor that was later removed by some sort of remote firmware upgrade, you could still buy or send ringtones to it and even change the icon where the operator logo would go. Externally too the whole case was replaceable my phone soon sported a transparent blue case with a mod that gave it flashing led backed keypad when there was a phone call. Another improvement was the game Snake II this time you could take the walls away to make the game last even longer, I would play on the highest speed to get the best score. I don’t recall what happened to this phone but needless to say there was an upgrade to it. Released in around 2000 and owned around let’s say 2003. Not to be confused with the Nokia 6210 Navigator this was my first foray into the Business phones, for their time they would have been much more advanced then the entry level phones this was the same age as my previous phone but being a business phone was a little more advanced the most memorable feature being WAP, which much to everyone’s bemusement stands for Wireless Application Protocol this allowed very limited access to the web on specially designed WAP sites it was very underwhelming and the most use this ever saw was checking train times on the national rail WAP site. This phone was not customisable except for a very small tab below the keypad, not very exciting but again you could change the ring tone and the operator logo. Another mystery phone upgrade I believe I continued using my Orange SIM card with this phone but somewhere along the line I upgraded to an o2 SIM Card as a lot of my family were now on o2 so it made sense for cheaper calls. Released in around 2002 and owned around 2004. This phone truly seemed like a new phone with the blue backlit screen replacing the green backlit screen seen in every other phone I had owned. WAP browsing was back again but this time it was called GPRS and was meant to be better but still didn’t get you much more than the train times and the weather report. This being an upgrade to the Nokia 6210 not much has changed only new features have been added such as the battery draining Bluetooth, but the only thing to connect it to was the computer and even then I couldn’t get it do anything as I didn’t have a Bluetooth headset at the time. I do still have this phone with a spare battery and use it when I need a long lasting standby time, until recently I used it every year as my Glastonbury Festival phone as I didn’t want to take my current phone and lose it I would take this although to begin with I noticed very poor reception with the o2 network in the valleys of Avon and Somerset so for success in later years I had an Orange SIM card just for Glastonbury and 2 for 1 Cinema tickets with Orange Wednesdays. However as a fan of Retro technology as well as new gadgets I couldn’t resist making the following phone my main handset. Released in around 1998 and owned around 2005. My fifth phone but also my oldest phone, my friend @dalejpotter had given this to me as an interesting thing he had found but didn’t want it, so I jumped at the chance to make it my own, it was dead to begin with but I bought it a new phone charger, strangely every other Nokia I had owned used the same charger but this one was different, I also bought it a new battery and it was ready to go. Strangely this phone was a downgrade and at first I missed a lot of basic features like a clock or a calender being able able to store more than 10 messages and 100 contacts. But the retro aesthetics were undeniable the sliding mouthpiece was very cool for this aged banana-phone but it’s appearance in the first Matrix film meant I had to keep using it. Keeping with the retro theme I bought myself an original Palm Pilot to accompany it this solved the issue of not having a calendar and also allowed for more detailed list of contacts and a handy place to keep notes and also play my favourite game Daleks I had originally played this on the Atari ST and a Handspring Visor Deluxe that I had for a time in college. But the limited features of the phone eventually got to me and it was time for an upgrade of sorts. Released in around 1999 and owned in 2007. An upgrade of about a year but what an upgrade I moved from an entry level phone back up to the business phone of it’s era the newly introduced Nokia Communicator Series began with the Nokia 9000 the previous year and so retrospectively I had the choice to start further down the line but I settled on the second iteration of the phone in this series and almost immediately the Palm Pilot was put to one side as this phone opens up to reveal a PDA (Personal Digital Assistant) inside. 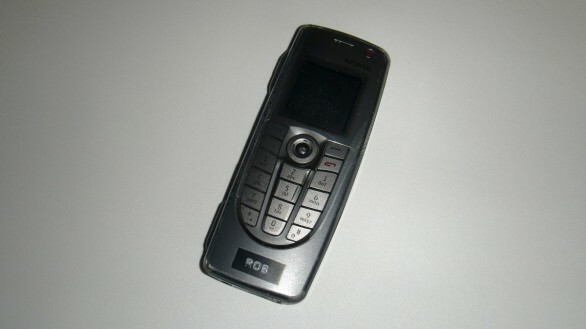 Memorable features of this phone include WAV ringtones, photos of your contacts, a serial cable to backup to a computer, an MMC Memory card slot and of course a full QWERTY keyboard, back came the WAP browser but again not much improvement even from this advanced phone. An unusual feature of these phones is the positioning of the speaker and microphone on the back of the phone instead of the face, this takes some getting used to and is also a bad habit to break when switching to another phone. I was obsessed with this phone for quite some time, I trawled ebay to get every accessory I could and I now have a box full of spare parts to prove it I even have the desk serial dock with space to charge another battery at the same time. definitely very advanced for it’s time and even on par with the then modern phones, it may not have had a colour screen but the ability to start the phone up and make a call in less than 15 seconds beat the “smart” phones hands down. As a side note I did own the next phone in the series the Nokia 9210 with the colour screens but issues with the phone meant I never fixed it or used it. It wasn’t until much later that I realized it was time for an upgrade. Released in around 2005 and owned in 2009. This further upgrade to the Nokia Communicator Series although not officially under the Communicator brand like it’s bigger partner the Nokia 9500. This upgrade came about when I realised that my initial retro buzz over the Nokia 9110i had turned as I put up with it’s cumbersome size. 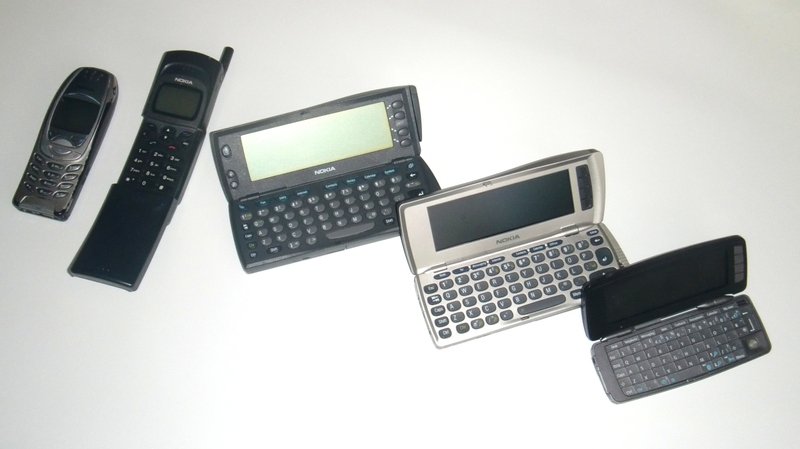 The Nokia 9300i was definitely the answer to that with it’s smaller form factor but still retaining what made the Communicator series great like a QWERTY keyboard. This model introduced many new features to the series such as Wi-Fi, Bluetooth, MP3 ringtones and true Web browsing on the move with it’s built in Opera browser. Although this phone may seem slow by today’s standards I enjoy being able to use a physical QWERTY keyboard to write messages and even do some basic word processing and spreadsheets on the move and of course certain games must have a physical input. Quite an unusual history but there is something to be said for the older phones especially if you just want to make phone calls or send text messages and not to use thousands of apps to find out where the nearest fish ‘n chip shop is and find out how good it is from reviews online. Do you have any fond memories from your mobile phones past or present?